Time tracking, payroll, invoicing, and more. 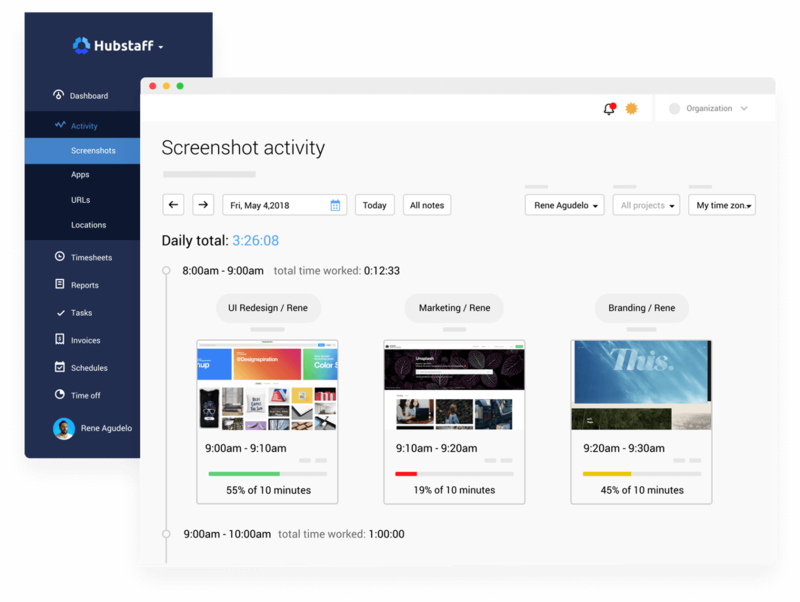 Track time wherever and whenever your team works with lightweight Hubstaff desktop and mobile apps. Generate the most accurate timesheets to easily invoice clients and pay your team. Never set another timesheet reminder. Record employee hours and view online reports to optimize your company’s performance. So easy, your team will love using it. See work unfold in real time with optional screenshots, app, and URL tracking. Teams can keep moving forward while progress is captured seamlessly. Or, turn off the feature altogether. Record time on the road and at work sites with mobile-based time tracking. Your team can clock in and out from anywhere, and you’ll get better job costing, scheduling, and payments. Create job sites where time tracking automatically starts and stops when your team arrives or leaves. Or, set reminders to start upon arrival. Payday should be a good day for everyone, even business owners. With Hubstaff, you can set up pay rates once for each member of your team or project, so payments are automatically sent based on hours worked during that pay period. Our online scheduling app provides you with a simple employee attendance tracker and staff scheduler. Now, you can easily see who’s working when at any time. Turn any device into a central time clock with the Hubstaff app. Get real-time data and attendance tracking from your dashboard. Better estimate, budget, track, and invoice projects. No more manual invoices. Track time, bill, and manage payments. Set time and budget limits with alerts for projects and team members. Drill down into projects by tracking time against specific tasks. Track time anywhere. Hubstaff syncs once you’re back online. No need to download and install apps. Track right from your browser. Review, approve, or reject timesheets. One app for tracking holidays and time off requests. Over 30+ integrations with your favorite business apps. Your time is valuable. Our team is here to provide answers and guidance in a timely fashion so you can get back to work sooner. Get your team on time and going after their goals today. See how Hubstaff can help you grow.